MAP stands for Measures of Academic Progress. 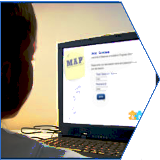 MAP is a computer-adaptive benchmark assessment in reading and math. It provides a different, personalized test for each student. Depending on how a student answers each question, the test adjusts in difficulty. This allows students with widely varying skill levels – from struggling to advanced – to take a test that is well-suited to their needs. Teachers are able to access student scores immediately after students complete a test. Each test provides detailed teacher reports that show the skills students are proficient in and what they are ready to work on next. Click here to download a MAP Parent Brochure. RIT is a unit of measure that uses individual item difficulty values to estimate student achievement. Similar to measuring height on a yard-stick, the RIT scale is used to measure how "tall" a student is on the curriculum scale and scores can be compared to tell how much growth a student has made.. It is important to remember that the RIT score is one of the most important pieces of information on a student’s report. 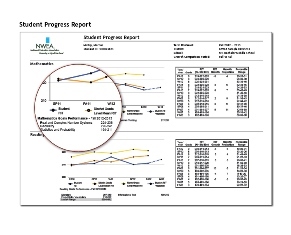 This score is independent of the age or grade of the student, and reflects the instructional level at which the student is currently performing.